Carbon fibre has long been associated with lightweight and its development has steadily evolved, but not all carbon fibre materials are the same. 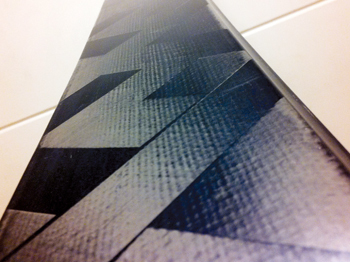 The TeXtreme Technology is based on using thin flat tapes instead of round yarns, a patented process that provides unique possibilities for weight savings and performance improvements compared to other carbon fibre materials. The use of TeXtreme carbon fibre materials, combined with the expertise of the TeXtreme team, has resulted in victories for athletes using products reinforced by TeXtreme in competitions such as Formula 1, the America’s Cup, the Tour de France, the Kona Ironman, the Daytona 500, the Stanley Cup, etc. “We are very happy that our materials and knowledge of how to design and choose the right carbon fibre reinforcements gives such outstanding results. The work done by our customers and the success seen by athletes using their products shows we are on the right path. In addition, our technical story has helped brands explain why their product is technically superior,” says Andreas Martsman, VP – marketing and sales of Oxeon AB, makers of TeXtreme. Current licensed TeXtreme users include: Bauer Hockey, Prince Tennis, Cobra Puma Golf, Bell Helmets, Felt Bicycles, North Kiteboarding, Stiga Table Tennis, Fanatic Windsurfing, Jones Snowboards, Berria Bike, PRO Shimano, and many more. TeXtreme’s signature square pattern makes it stand out from the crowd. Connecting it with the outstanding references and current users, the TeXtreme Technology yields high-quality, high-performance, lightweight carbon fibre results. In general, TeXtreme can reduce weight by 20 to 30 per cent compared to conventional carbon fibre materials, with maintained or increased levels of stiffness and/or strength. Besides being successfully used in sporting goods products, TeXtreme is commonly used in various industrial and advanced aerospace applications.